Boutique Badges: Order as few as 5-25! Custom Embroidered 3" Patches are distinctive and professional. If your employees wear uniforms, patches are a great way to recognize position, years of service, department etc. Prices range from $4.63 to .94 each. 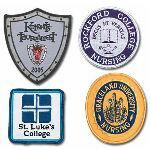 Custom Embroidered 4" Patches are distinctive and professional. If your employees wear uniforms, patches are a great way to recognize position, years of service, department etc. Prices range from $6.65 to $1.33 each. Custom Embroidered 2 1/2" Patches are distinctive and professional. If your employees wear uniforms, patches are a great way to recognize position, years of service, department etc. Prices range from $3.59 to .85 each. You must be 100% satisfied or you can return your merchandise for up to six months! © 2019 Kenberma Products, All Rights Reserved.